Antwan is knee deep in a snowdrift 8,000 feet above sea level. 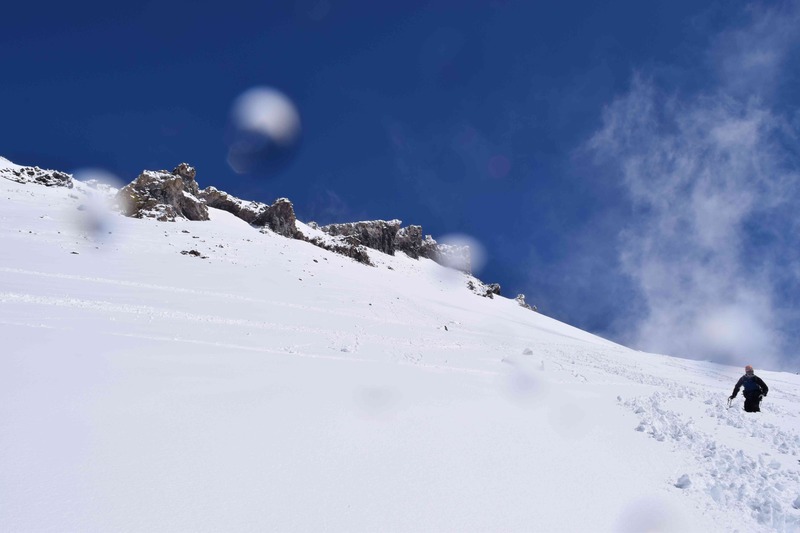 Below, the gradually softening slope of the 14,000-foot volcano in Northern California is covered in a thick blanket of snow. Even further down, the trees are brushed in white. Starting in the dark of 3:00 a.m., the group pushed through a steady snowfall. One of the more experienced climbers broke trail, plowing through 18 inches of fresh, sticky powder, which left a distinct path down to where the group had camped. It is June 18, and snow like this shouldn't happen. But it did, and the group is better for it. The day before, Antwan and his brother Terrick saw snow for the first time. In San Diego, the 21-year-old Antwan explained, he remembers buying blocks of ice as a kid and using them to slide down grassy lawns. "The ghetto way," Terrick added with a chuckle. In the cold, snow-covered pre-dawn Antwan says, "I am all wet." He decides to go down. And I, after five years of leading this climb up Mt. Shasta, am happy to join him. We descend, our feet plunging into the snow. Antwan says it's all beautiful. He tells of his days working as firefighter, frantically clearing brush as forest fires blazed. It isn't that far down to the campsite, where the tents are covered in snow, but we take our time. Antwan is wet and cold, but he, like me, is happy. By the ground where the group laid its tents sits a stone cabin with an impressive steel roof. The place is called Horse Camp. The clouds gather once more, and the sky threatens snow. Antwan and I enter the cabin. It is as cold inside as outside. The snow picks up again, falling silently outside the windows. There is deep iron stove and even some wood piled next to it, but Horse Camp's caretaker, a gruff yet pleasant German woman, tells me the wood is only for emergencies. We are in a blizzard in late June in California: maybe not an emergency, but a very special occasion. Antwan and I look at each other disappointed. But a few minutes later the caretaker relents and hands me some newspaper. "I carried this all the way up here," she says sarcastically. I put the newspaper in the iron fireplace. Antwan and I gather up some kindling and light the fire. Antwan sits, elbows-on-knees, face-in-hands, on a bench pulled close to the fire. Soon I hear him snoring. In a couple of hours the snow stops. The sun comes out. Slowly the group comes back down. Everyone is happy. Usually we count the number of former foster youth and adult supporters who make it to the summit. We always marvel that the foster youth complete the substantial climb at higher rates than the non-foster folks in the group. This year no one makes it to the top. No one cares. We smiled and laughed through a freak snowstorm and -- to a person -- vowed to come back. If you are inspired to support the Foster Youth Questival in all its snow covered glory, please hit the donate button below.